The upcoming first Boeing Dreamliner 787 for Biman Bangladesh Airlines drew attention of all spectators as it joined the prestigious Farnborough Air Show in London on Tuesday. 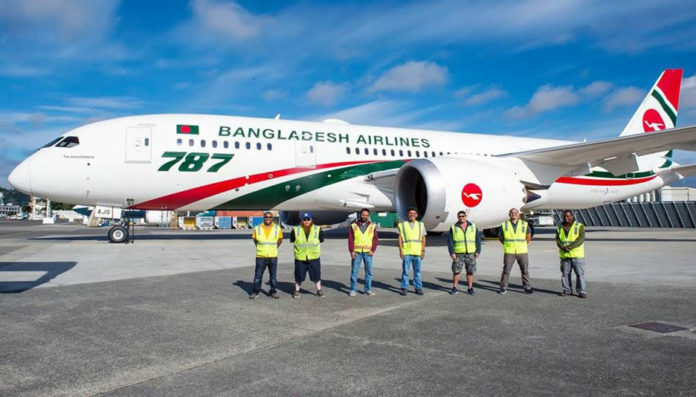 “Biman’s first Boeing Dreamliner was at the centre stage and stole the largest Air Show on the earth at Farnborough, UK yesterday,” Biman’s General Manager PR Shakil Meraj told BSS over the phone from London today. He said the fourth generation aircraft flew over the London sky for 15 minutes with a spectacular maneuvering flight at 2.50 pm local time. Boeing 787-8 is one of the four Dreamliner aircraft which is to be added to the fleet of the national flag carrier within 18 months. “The Boeing 787-8 Dreamliner, which was showcased at the air show, is Akashbeena, one out of four Dreamliners that will be added to our fleet soon,” Shakil said. 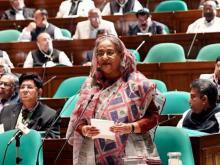 Prime Minister Sheikh Hasina has already named the four new aircraft: Akashbeena, Hansabalaka, Gangchil, and Rajhansa. Two Boeing 787-8 Dreamliners will join the fleet in August and November this year respectively while two other aircraft will be delivered in September 2019, official sources said. The Akasheena that showcased at the expo is scheduled to reach Bangladesh from the Boeing factory on August 20. The Boeing 787, which is considered to have state of the art technology in the global aviation industry, will not only ensure a comfortable journey but also include new technologies, Biman officials said. In 2008, Bangladesh signed a $2.1 billion purchase agreement for 10 planes. Of these, Boeing has delivered four 777-300ER’s and two 737-800’s to Biman. The remaining four 787 Dreamliners are awaiting delivery. The 2018 edition of the Farnborough International Air Show, organized by US aircraft giant, Boeing, is being held from July 16 to 22 in Great Britain. At the Air Show, Boeing is presenting its products and services to define the future of aerospace, said a press release issued by the company on July 9.